At the intersection of where science and medicine meet spirituality, Dr. Anna Yusim has written a book to serve as a guide for doctors and patients to reconnect with their souls. When it comes to medical addiction treatment, doctors do not always have all of the answers. Dr. Yusim understands that there is no one-size-fits-all solution to help all patients. The solution lies in finding spiritual solutions that are unique for each patient. Doctors can also apply these principles in their own ... See More lives. 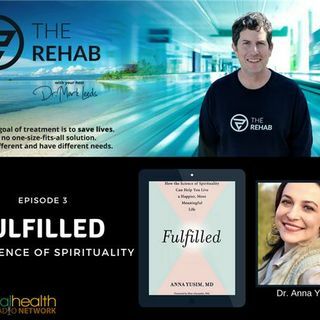 This episode of The Rehab with your host Dr. Mark Leeds features an interview with award-winning, best-selling author, Anna Yusim, M.D., Her book Fulfilled, guides the reader through case studies and exercises to help reconnect with their soul and find purpose in life. This book will be useful to people who suffer from addiction, anxiety, depression, and more. Dr. Anna Yusim is an award-winning, nationally recognized psychiatrist, speaker, and author with a private practice in New York City. She is a Lecturer on the Clinical Faculty of the Yale Psychiatry Department. After working as a neurobiology researcher and completing her studies at Stanford, Yale Medical School, and the NYU Psychiatry Residency Training Program, Dr. Yusim felt that something was missing from her life. In her quest to find it, she traveled, lived and worked in over 50 countries, while studying Kabbalah, learning Buddhist meditation, and working with South American shamans and Indian gurus. Dr. Yusim has published over 70 academic articles, book chapters, scientific abstracts and book reviews on various topics in psychiatry.